The federal city of Bonn is one of the largest cities in the Cologne Lowland, second only to Cologne itself in terms of population count. Despite the size, it maintains a cosy, relaxed atmosphere of a small town, featuring mostly low-rise buildings, a charming old town and a lot of greenery. Located only 28 km south of Cologne up the Rhine river, it has a wealth of museums and points of interest. Bonn's beginning dates between 13-9 BC when Romans began building roads, bridges, and fortresses at a location known as "Bonna." One well-documented event was the martyrdom of two Thebaean legionaries. The Thebaean Legion was an all Christian legion, which refused to worship the emperor as a god. As punishment, the Thebaean Legion's commander, Mauritius was executed in St. Moritz as were many other Thebaean legionaries including Cassius and Florentius, Bonn's patron saints, who were martyred at the location of the present-day Münster basilica. After the Romans left, the town had a very tumultuous history. Bonn has been destroyed and pummelled on so many occasions that it nearly became a pastime. Norman invaders were the first to burn the town to the ground in 881 and again in 892. In 1198, King Philip of Swabia and Duke Heinrich von Brabant laid siege to Bonn. In 1244 Konrad von Hochstaden, archbishop of Cologne ordered Bonn to be fortified. The reasons for fortification may have been for the Archbishop's protection as he had apparently begun fighting with Cologne's leaders and often resided in Bonn after the dispute. 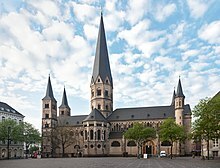 In 1288 under Sigfried II von Westerburg the archbishopric was transferred from Cologne to Bonn, which has since been transferred back to Cologne. In 1582 Archbishop Gebhard Truchsess von Waldburg converted to Calvinism and refused to give up his position as elector. In February of 1583 Waldburg married and was in April of the same year excommunicated by Pope Gregory XIII. After the Truschessian War Gebhard fled to Strasbourg, but not before Bonn felt the rapture of Bavarian troops, who blew up the Godesberg (the archbishop's residence) with 1,500 pounds of gunpowder. While the town survived the Thirty Years' War Bonn was completely destroyed in 1689 as a result of the War of the Grand Alliance. In December 1770 Bonn's most famous son, Ludwig van Beethoven, was born on Bonngasse. Bonn is probably best known as Beethoven's birthplace and this fact is well advertised by the city despite Beethoven's vehement disgust towards his hometown. Beethoven spent some time in Vienna hoping to study with Mozart, but after his mother's death he was forced to return to Bonn for five years to raise his two younger brothers since his alcoholic father was unable to. In 1792 Beethoven returned to Vienna and never came back to Bonn. While Bonn is by no means a "village" its selection as seat of the government of the new west German state in 1949 was precisely because the partition of Germany should appear to be temporary and thus more important or symbolic cities such as Cologne, Munich or Hamburg were soon out of consideration. However in the final decision the fact that Konrad Adenauer had a house nearby may well have played some if not the decisive role, where Bonn beat out Frankfurt by a single vote. See also Cold War Europe. After reunification it was seriously considered to keep the government in town, especially as the previously "provisional" facilities had just been upgraded bit by bit in the late 1980s. However in another close vote the Bundestag decided to move most agencies to Berlin, while some would stay in Bonn much to the chagrin of people who see the double facilities as needless pork in favour of Bonn. Südstadt, the southern part of the city owns impressively beautiful buildings from the late 19th and early 20th century in ancient alleys. You can get an English walking tour brochure from the Tourist Information. 50.734537.097951 Bonn Information, Windeckstraße 1, 53111 Bonn (street between the post office and Karstadt), ☎ +49 2 28-77 50-00. M-F 10AM-6:30PM, Sa 9AM-4PM, Su 10AM-2PM. The tourist information offers almost all the help a tourist could need. They also have brochures about walking tours in English. You can also buy tickets for the theater and the opera there. That said, the airport sees very little intercontinental passenger traffic, save for a few flights to countries like Turkey, Morocco or Iran operated by the respective countries' airlines and serving mainly local ethnic minorities. From the airport, take the SB60 airport bus (€8.20) to Bonn's central bus station near the Hauptbahnhof. It leaves every 30 minutes from outside Terminal 1 arrivals, and takes a little over half an hour to reach the Bonn city centre. You can also take a train from the airport to Bonn-Beuel, which is on the other side of the river from Bonn city (Zentrum). A taxi to central Bonn will cost around €45. 50.7319447.0969442 Bonn Central Station (Bonn Hbf), Am Hauptbahnhof 1, ☎ +49 228-715324, fax: +49 228 715324, e-mail: bonn@dbreisebuero.de. Despite the name, meaning Bonn central station, it is mainly served by local and regional trains, and also acts as the hub for Bonn's light rail system (Stadtbahn). You can arrive there from Cologne on the S-Bahn, as well as Frankfurt and Koblenz via the longer, scenic route. 50.79387.20253 Siegburg ICE-Bahnhof. The station on the right hand side of the Rhine is where most high-speed trains (ICE) stop, instead of Bonn Hauptbahnhof. You can get there from Bonn's city centre in around 20 minutes by using tram S66. 50.73847.127424 Bonn-Beuel (to the right side of the Rhine). only Regional trains RB27 and RE8. Traveling by long distance bus, you would typically take the bus lines to Cologne and then continue your travel to Bonn by regional train. Bonn has an excellent bus, night bus, tram and subway system operated by the local Stadtwerke Bonn. There are ticket offices and vending machines at major stations, offering single tickets (€2.70), multiple tickets and both 24-hour and weekly passes. The tickets are valid in local trains, Stadtbahn (subway), tram, buses and night buses. 50.731347.098052 Radstation, ☎ +49 228 9814636, e-mail: radstation@caritas-bonn.de. starting at 10€ per day. 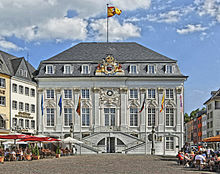 50.735017.102921 Old Town Hall (Altes Rathaus), Markt (at the market place). Built in 1737 in Rococo style. 50.733487.099692 Bonner Münster, Gerhard-von-Are Straße 5, ☎ +49 228-98 588-0, e-mail: pfarrbuero@bonner-muenster.de. Church 7AM-7PM, cloister 9AM-5PM. A beautiful basilica, in Bonn's city center. Only Bonn Information or the Bonner Münster Foundation are permitted to arrange guided tours to the basilica. The "Bonn Information" organization can arrange for non-German tours. 50.714337.08023 Kreuzbergkirche, Stationsweg 21, e-mail: info@kreuzberg-bonn.de. In summer 9AM–6PM, winter 9AM-5PM. Visit of the Holy Staircase 9AM–5PM. The church is a beautiful example of baroque architecture. Today, the church serves as both a church and a German language and culture school, but is probably best known for the "Heiliger Steige." The church was erected in 1627/1628 on the orders of the archbishop to replace an older chapel. In 1746 Elector Clemens August von Bavarian donated the "Heiliger Steige", or holy staircase, which, according to legend has pieces of the cross the crucified Jesus set into the stone. Small brass crosses on the second, eleventh, and last steps mark the spots where the pieces of the cross are supposed to be set. Beautiful view over Bonn. 50.73387.102224 Universität Bonn (University Main Building), Regina Pacis Weg 3. 8AM-10PM. It is in the former residential palace of the Archbishop and Kurfürst of Cologne, built by Enrico Zuccalli from 1697-1705. It stretches from Kaiserplatz to the Rhine (Alter Zoll) and crosses two streets (Stockenstraße and Adenauerallee), the gates are called Stockentor and Koblenzer Tor. The building looks impressive and beautiful from the outside, but could use a renovation inside. Feel free to walk in. Best view on the palace is from the Hofgarten side. The Hofgarten is a park directly in front of the palace and a place for students to meet and relax in the summer between and after lectures. During Bonn's times as capital, it saw all the major anti-government demonstrations. 50.725057.092285 Poppelsdorfer Schloss and Botanical Gardens, Crossing of Poppelsdorfer and Meckenheimer Allee. Apr-Oct 10AM-6PM, Nov-Mar 10AM-4PM, Sa closed. Was built as a resort in rococo style for the Archbishop of Cologne Clemens August from 1715 to 1753 by Robert de Cotte and today houses the university's mineral collection, several science departments and the botanical gardens. The palace itself is not open to the public. The botanical gardens next to the palace are a peaceful and beautiful place to relax, have a look at the sunbathing turtles at the pool. The gardens cultivate about 10.000 plant species. The green houses were recently renovated. Coming from the city center, walk there from the University Main Building via Kaiserplatz and Poppelsdorfer Allee. Free, on Sunday and holidays €3 (reduced €1). 50.735637.090636 Alter Friedhof, Berliner Platz (Stop Stadthaus). The old cemetery, created in 1715, is an atmospheric cemetery with many old graves, among them the graves of Robert and Clara Schumann, Ernst Moritz Arndt, Friedrich Schiller's wife Charlotte von Schiller and their son. 50.750677.114887 Doppelkirche in Schwarzrheindorf, Dixstr. 41 (on the other side (some say the wrong side) of Bonn in the suburb of Schwarzrheindorf). Tu-Sa 9AM-6:30PM (9AM-5PM in winter), Su 11AM-6:30PM, M closed. The double church St. Maria (upper level) and St. Clemens (lower level) was built in 1151 and is due to its rich ceiling paintings of saints and apocalyptic scenes one of the most outstanding romanic churches in Germany. Take Bus no. 640 or 550 to Schwarzrheindorf. You can walk back to Bonn Beuel or Bonn's city centre by following the dam and crossing the Kennedy bridge, it is a popular promenade. Take a break at Bahnhöfchen or Rheinlust near the bridge. 50.757217.10578 Jewish Cemetery. The old and small Jewish Cemetery is in Bonn Schwarzrheindorf between the Doppelkirche and the North Bridge, you can access it from the dam which is a popular promenade. 50.711437.144889 Rheinauen (take line 66 to Bad Honnef/Königswinter stop Rheinauen). A big park in the south of Bonn directly behind the Post Tower. You can walk there from the city centre following the rhine promenade, it is about 3 km and very popular on the weekend. 50.717457.127410 Deutsche Welle Headquarters and Radio Studios, Kurt-Schumacher-Straße 3, ☎ +49 228-429-2538, fax: +49 228 429-2040, e-mail: visitor.service@dw-world.de. Tours leave M-Fr 10AM, 2PM. Deutsche Welle (Also known simply as DW) is Germany's international media outlet and is now housed in what was supposed to be the German parliament's home. 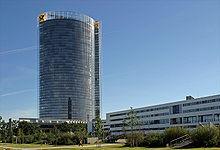 After the German government decided to move the building was taken over by DW to become its headquarters and home to its radio operations. Tours are conducted in German, however, tours can be arranged in English, French, Spanish, or Portuguese when requested in advance. DW asks that anyone wishing to take a tour reserve at least two months in advance and may require you to be with a group of 6-20 persons, however, they may arrange an exception if contacted. Tours last an average of two hours. Tours are free. 50.66777.022711 Kottenforst. A big nature park between Bonn (quarters Venusberg, Bad Godesberg) up to the cities of Euskirchen and Wachtberg. It is appr. 4.000 ha and popular for walking tours. The nearest ones starts at Waldesruh on Venusberg (which has also a nice cafe). Another route starts at Bahnhof Kottenforst (a pretty frame house) which you can reach by taking a train to Euskirchen, but the train only stops there on weekends). 50.721397.1180612 Palais Schaumburg, Adenauerallee 139/141. Until 2001 it was used to house the office of West Germany's chancellor and the chancellor's cabinet. Today, the building is used as a secondary headquarters for the chancellor. 50.722767.1175513 Villa Hammerschmidt, Adenauerallee 135. Between 1951-1994 the Villa Hammerschmidt served as the residence of the West German President, however, since the relocation of the German government to Berlin the building serves as a secondary residence for the president. 50.734627.1062314 Ägyptisches Museum, Regina-Pacis-Weg 7 (University of Bonn. U-Bahn stop: Universität / Markt), ☎ +49 228-739710, fax: +49 228 737360, e-mail: aegyptisches-museum@uni-bonn.de. Hours: Tues. - Sun. : Noon - 18. Closed Mondays and holidays. The University of Bonn-administered Egyptian Museum. Admission: Adults: €3.50, Students and Children (7 years+): €2.50, Family ticket (2 adults and 3 children): €9. 50.731657.1061315 Akademisches Kunstmuseum, Am Hofgarten 21, 53113 Bonn. Tu&Th 10-16, Sun 11-16, closed on public holidays and in August. the academic museum of antiquies is situated at the other end of the Hofgarten park, directly opposite to the main building. It is a beautiful building, constructed from 1823-1830 and designed by Karl Friedrich Schinkel and Hermann Friedrich Waesemann, and hosts one of the largest collections of plaster casts of ancient Greek and Roman sculptures in the world. Entrance fee €1,50, free admission for students. 50.730717.1050816 Arithmeum, Lennéstraße 2, 53113 Bonn (Subway Stop: Universität / Markt Busses and Trams: Hauptbahnhof), ☎ +49 2 28-73 87 90. Tuesday - Sunday 11AM-06PM. The Arithmeum features a collection of historical mechanical calculating machines, which today comprises more than 1200 pieces and is the largest in the world. It features the history of calculators, from ancient abacuses and ropes with knots, until the modern day PC. The design of the building itself and its colorful art collection are an added bonus. €3 / €2. 50.73697.1017917 Beethoven-Haus (Beethoven House), Bonngasse 18-26 (Take trams (62 or 66) or buses to Bertha-von-Suttner-Platz / Beethoven-Haus), ☎ +49 228 98175-0, fax: +49 228 98175-26, e-mail: info@beethoven-haus-bonn.de. 1 Apr-31 Oct M-Sa 10AM-6PM, Su & holidays: 11AM-6PM; 1 Nov-31 Mar M-Sa 10AM-5PM, Su & holidays 11AM-5PM; closed New Year's Day, Carnival-Thursday, the Monday preceding Ash Wednesday, Carnival-Tuesday, Good Friday, Easter Sunday and 24-26 Dec, New Year's eve. The birthplace of the great composer is now a museum dedicated to his life and work. The museum even has a lock of Beethoven's hair on display. Somewhat ironically Bonn advertises their hometown son despite Beethoven's vehement hatred for his hometown. With a competent docent this museum is well worth the visit and is more interesting than Mozart's Geburtshaus in Salzburg. 50.737467.0867818 August Macke Haus, Bornheimer Straße 96 (U-Bahn stop: Bonn West), ☎ +49 228-65 55 31, fax: +49 228 69 15 50, e-mail: buero@august-macke-haus.de. Hours: Tues - Fri. 2:30-6PM. Sa, Sun, & holidays 11AM-5PM. August Macke, a leading member of Der Blaue Reiter, a famous expressionist group, lived in this house with his wife, Elizabeth, for a few years and produced over 400 works in the top floor studio. Admission (regular/reduced): Adults: €3.50 / €2.50, Children: €2.50/ €1.50. 50.717617.1190419 Haus der Geschichte (House of the History of the Federal Republic of Germany), Willy-Brandt-Allee 14 (U-Bahn linien 16, 63, 66, „Heussallee / Museumsmeile“), ☎ +49 228-91 65-0, fax: +49 228 91 65-302, e-mail: post@hdg.de. Tue - Fri 9AM-7PM, Sat, Sun and Christmas season 10AM-6PM, closed on December 24, and 31. An interesting explanation of German history after 1945 that is constantly updated. A must if you are interested in history or politics. Exhibitions are presented in German only, but guide booklets with English translations are available for a couple Euros, and guided tours for school groups conducted in English are available free of charge when prebooked. Free admission. Tour groups with a guide: Tel. : (02 28) 91 65-400 or besucherdienst-bonn@hdg.de. 50.715247.1207420 Kunstmuseum Bonn, Friedrich-Ebert-Allee 2 (Museumsmeile. U-Bahn stop: Heussallee. Bus 610 will also stop at Heussallee), ☎ +49 228-776260. Tues. – Sun. : 11AM-6PM, Wed.: 11AM-9PM. Closed on Mondays; February 23 and 27; December 24, 25, and 31.. Modern art museum with a large and interesting collection as well as a good cafe Admission: Adults: €3. Students, Children (over 6), and Bonn-Card holders: €1.50. Family ticket: €6..
50.713977.1221421 Kunst- und Ausstellungshalle der Bundesrepublik Deutschland, Friedrich-Ebert-Allee 4, ☎ +49 228-9171-0. hosts permanently changing exhibitions which range from visual art and cultural history up to science and technology. Most of them are world class and definitely worth a visit. 50.698957.1511322 Deutsches Museum Bonn, Ahrstraße 45 (U-Bahn stop: Hochkreuz/Deutsches Museum Bonn), ☎ +49 228-302-255, fax: +49 228 302-254, e-mail: info@deutsches-museum-bonn.de. Tues. - Sun. : 10-18. Closed Mondays; Thursday before Fat Tuesday; Fat Tuesday (Shrove Tuesday); Good Friday; May 1; December 24, 25, and 31.. Admission: Regular: €4, Children (6 years+): €2.50, Family ticket: €7. 50.722227.1138823 Zoologisches Forschungsmuseum Alexander Koenig (Zoological Research Museum Alexander Koenig), Adenauerallee 160, ☎ +49 228-9122 211, fax: +49 228 9122 212, e-mail: info.zfmk@uni-bonn.de. Hours: Tue., Thurs. - Sun. : 10:00-18. Wed.: 10.00-21. Closed most Mondays (except on legal holidays); Christmas Eve, Christmas Day, and New Year's Eve. Zoological museum. Admission: Regular: €3, Discounter (Seniors, students): €1.50. 50.74077.0924624 Frauenmuseum, Im Krausfeld 10, 53113 Bonn. Tu. - Sat. 14-18, Sun. 11-18, closed on Mondays. The first museum in Europe dedicated to women and their work. Changing exhibitions. Adults €6, Students €3. 50.73547.1181825 Heimatmuseum Beuel, Wagnergasse 2-4, 53225 Bonn. Sat. & Sun. 15-18. Museum on local history. The museum was established in 1986 on the initiative of Beuel's Local Historical Society. Free. 50.73197.092526 Rheinisches Landesmuseum, Colmantstr. 14-16, 53115 Bonn. Tu. - Fr. & Sun. 11 - 18, Sat. 13 - 18 , Mon. closed. Museum of art and archeology, run by the Rhineland Landscape Association. Beethovenfest, ☎ +49 228-2010 345, fax: +49 228 2010 333, e-mail: info@beethovenfest.de. 2013 from Sept 5 till Oct 5. A month long music festival in September with numerous concerts held in Bonn and aroung the Siebengebirge region. Many international musicians are showcased during the festival. 50.736577.107121 Oper Bonn, Am Boeelagerhof 1 (next to Kennedy Bridge), ☎ +49 228 7780-08. Hosts classical music concerts, opera and dance. Check their website for a recent playing schedule. You can get tickets at the Theaterkasse, Windeckstr. 1, next to Münsterplatz from M-Sa 9AM-6:30PM18.30, Sa 9AM-4PM. Box office opens 1 hour before the performance begins. Ticket prices are moderate, especially for students. 50.740877.105392 Beethoven Orchester Bonn, Wachsbleiche 1, ☎ +49 228-45 49 3-0, fax: +49 228 45 49 3-25, e-mail: info@beethoven-orchester.de. Bonner Kammerchor, e-mail: info@bonner-kammerchor.de. An amateur chamber choir made up of roughly forty members. The choir occasionally hosts free shows. Kinopolis, Moltkestraße 7-9, Bad Godesberg (Train station Godesberg or line 16 to Bad Godesberg Bahnhof), ☎ +49 228-83 00 83. A functional multiplex in Bad Godesberg that shows one or two Films in the Original Version a day. Special prices Mon-W and for students. 50.727417.074773 Rex, Frongasse 9 (Bus line 608, 609, 610, 611, get off at "Auf dem Hügel", 606 to Brahmsstraße), ☎ +49 228-62 23 30. Arthouse cinema in Bonn Endenich (Frongasse 9) which regularly shows movies in the original version. 50.73377.10263 Rheinische Friedrich-Wilhelms-Universität (Universität Bonn). Goethe Institut, Friedrich-Ebert-Straße 11, ☎ +49 228-95 75 6-0, e-mail: Bonn@goethe.de. 50.689047.145391 Haribo Factory Store, Friesdorfer Str. 121, 53175 Bonn. Haribo, the world-famous candy maker, has its headquarters in Bonn (Haribo is an acronym for HAns RIegel BOnn). The factory store is located near the old factory in Bad Godesberg, 500 m from U-Bahn 16 and 63 Wurzerstraße stop. It has a small exhibition of Haribo memorabilia as well as a huge variety of gummy sweets and gadgets. Entering is a bit of a Charlie-and-the-chocolate-factory moment. 50.73457.104351 Mandu, Franziskanerstraße 5. M-Sat 11-20. Small Korean snack bar, they offer Mandus, rolls, kimchi, glass noodles, cheap, friendly and very good. €2-8. Bagel Brothers, Maximilianstraße 14 (next to the train station), ☎ +49 228 918-0183. M-Fr 7.30-23, at 8.30-22, Sun 9-20.30. Healthy snacks: Bagels (of course), plain or with toppings, salads, juices, muffins, brownies, good coffee. They have a nice quiet terrace you would not expect in the city centre. €3-6. 50.736697.097472 Bönnsch, Sterntorbrücke 4 (near Friedensplatz in the central pedestrian zone), ☎ +49 228 65 06 10. M-Th 11AM-1AM, F-Sat 11AM-3AM, Sun 12AM-12PM. Local Bierhaus that brews its own beer. Food includes staples such as schnitzel with fries, steaks and other hearty fare. €15-20 including drinks. 50.739827.092883 Bierhaus Machold, Heerstraße (near the corner of Wolfstraße, Altstadt). M-Sat 5PM-11PM. Excellent German food and good beer in a nice pub. Beer garden in summer. Try the Jägerschnitzel! €7-15 for mains. Roses, Martinsplatz 2a (near Bonner Münster and Kaiserplatz), ☎ +49 228-433 06 53. 9-1, Sun 10-1. fancy restaurant for people mainly in their 30s and 40s. A good choice if you are not on a tight budget and if you like European food with a touch Italian. Dishes start from €12 (without drinks). Brunch on Sundays. Makiman, Sterntorbrücke 11, ☎ +49 228-721-6957. M-Th 12-15 & 17.30-22,Fr-Sat 12-20,Sun 16-21.30. Very good Japanese restaurant, besides very fresh sushi they also offer soups, curries, and salads. €8. 50.737787.105934 Rüen Thai, Berliner Freiheit 14 (next to Hilton and Kennedy Bridge), ☎ +49 228 651576. 11.30-15&18-24. Thai dishes, some of them very spicy, in a beautifully decorated setting. They also offer a very good cocktail selection (although rather expensive), but be careful - some of them can really knock you out. from €8. 50.745257.100085 Ristorante Caminetto, Römerstraße 83 (Bonn-Castell, bus stop Nordstraße). M-Sat 12-14.30 & 18-23. A very nice, family-run Italian restaurant in the heart of Bonn, where you get a selection of the finest wines and meals of the region of Piedmont. Just that you are not disappointed: although Italian, they don't have pizza. €12. 50.739727.092616 Mogul, Heerstraße 64 (Nordstadt), ☎ +49 228 695569. Best Indian restaurant in Bonn, although the restaurant makes the impression of a carefully redecorated garage the food is really good and the owners are friendly. It is also cheaper than other Indian restaurants. from €9. Karawane, Adrianstraße 104 (Straßenbahn 66 to Königswinter/Bad Honnef, get out at Oberkassel Nord, when getting out of the station turn two times to the left and follow the road. ), ☎ +49 228-9449680. 18-23. Oberkassel is a bit outside of the city centre, but Karawane is worth the effort. It is basically an "All you can eat" (but not a buffet) consisting of 10 dishes from the Mediterranean and Middle East region. The dishes change every week (see their website), you can order a vegetarian selection (without surcharge) or additional dishes like lamb. The atmosphere is nice and the service friendly. It is often crowded, so better call for a reservation. €15,60. Café Blau, Franziskanerstraße. 10-24. Mainly visited by students, this café is in the entrance hall of a public swimming pool. It is kind of "cult" to go there, famous caffe latte, good breakfast offers. from €2. 50.733117.101521 Goldbraun, Fürstenstraße. The Goldbraun Cafe boasts excellent espresso, comparable to Starbucks. 50.735337.10322 Café Miebach, Marktplatz, at Stern Hotel. One of the most traditional cafes in Bonn. Not cheap, but good service and excellent cakes. Customers are mostly elderly. In the summer, they offer 300 seats outside directly at the Marktplatz. Café Fassbender, Corner Sternstraße and Dreieck. Café Fassbender is known for its cake. It is a pastry shop and a café. Often very crowded. It is a great location for middle-aged or older people to visit. Arco, Sterntorbrücke 2 (near Friedensplatz). Very good breakfast offers, large breakfast for 2 incl. coffee for €8,90, friendly service. Schokoladen, Münsterstraße 7 (road between H&M and Karstadt). is located close to the central station. This small café offers excellent chocolate-based drinks. Freshly made with melted chocolate and milk you can enjoy it hot, cold or mixed with coffee or other drinks. You can also have an amazing chocolate fondue with fresh fruits and cookies. 50.735067.099893 Teestube Gschwendner, Dreieck 2. 10:00-19:00. Not a cafe, but a tea room in a beautiful frame house that hosts the Tea shop Tee Gschwendner. They brew high quality tea on the second floor and also have a small choice of cakes and scones. The shop on the first floor often offers free tea tasting of one or two teas in a Samowar. 50.734077.108294 Alter Zoll, Am Brassertufer (next to Koblenzer Tor), ☎ +49 228-241243. 11-23, but depends on the weather, open only in summer. The definite place to be on a beautiful summer night in Bonn. Alter Zoll is a large beergarden under an old tree with direct view of the Rhine and a wonderfully relaxed atmosphere. It can become very crowded and take 20 minutes to get your drinks. Many people and especially students also bring their own drinks and sit down on the meadow next to the beer garden. To find it, just follow the crowd at Koblenzer Tor down to the rhine. 50.736997.107545 Hausbar, Am Boeselagerhof 1 (Opera building). th&s 7-5, sun-wed 7-2. bar and restaurant with house music. Very popular and rather fancy and stylish, some say wannabe, do not dress too casually or you might have problems getting in. Beautiful view of the rhine. 50.735027.100596 James Joyce, Mauspfad (near to Dreieck), ☎ +49 228-369 56 71. Irish pub in the city centre, atmospheric, good food, large variety of beers and whiskies, live sports. Tacos, Bonngasse 7 (same street as Beethovenhaus), ☎ +49 228 655185. Popular Mexican Bar, Corona beer and great Cocktails. Happy Hour from 17-19.30h and 23.30-00.30h. Their food is also very good. Che Guevara, Münsterstraße 9 (street between H&M and Karstadt), ☎ +49 228 6297973. Mon-Th 19-1, Fr&Sat 19-3, Sun 18-1. Delicious cocktails, good atmosphere. Happy Hour Mon-Th 18.30-20.30, Fr&Sat 17-19 and Sunday, Cocktail €5,30. Mojito, Königstraße 9, ☎ +49 228 4228727. 18-?. Small and popular Cocktail bar, prices are moderate, they also have Pizza and Tapas. Very hot in the summer. Happy Hour 18-20: Cocktails €3,90 and Pizza €4,50. 50.739627.092917 Cafe Pawlow, Heerstraße 64. Situated in the multicultural Nordstadt, an atmospheric place to have a beer in summer. 50.739387.090568 Nyx, Vorgebirgsstraße 19. Another good place in the Nordstadt, especially in summer when they have a beergarden outside. 50.742617.100779 Shamrock Irish pub, Römerstraße 22, ☎ +49 228 9650251. Irish pub close to the city center. 50.735067.1041810 Blow Up, Rathausgasse 10. Dive bar. Speciality is funk and 60s. It can get smokey and very hot when crowded. 50.732737.1001811 Carpe Noctem, Wesselstraße 5 (near Hauptbahnhof). 22-5. Underground rock club with young patrons. Has occasional student parties boasting free entry and half-price drinks. If the club is packed, it will get uncomfortably hot. Dress light. 50.738237.092551 Max Hostel, Maxstraße 7, ☎ +49 228-82345780. Bonn's independent youth hostel in Nordstadt. Different rooms from single and double to dorms with 8 beds. from €19. 50.699497.091592 Youth Hostel Bonn Venusberg, Haager Weg 42, ☎ +49 228 289970. The official youth hostel is on the Venusberg which is about 20 minutes by bus from the city centre. There are night buses going there, but only one per hour. Bildungsstätte Haus Venusberg e. V.. Owned by the Catholic church. They offer singles, doubles, dorms, prices start at €25. 20 minutes outside the city centre. 50.7354151402827.10267606111413 Sternhotel Bonn, Markt 8, ☎ +49 228-72670, e-mail: info@sternhotel.de. The interior decoration is a bit old-fashioned, but the house has a lot of flair and history and it is at the Marktplatz in the middle of the city. from €69. 50.731427.104184 Hotel Eden, Am Hofgarten 6, ☎ +49 228-289710, fax: +49 228 225070, e-mail: reservierung@eden-bonn.de. Located pretty close to the city center. Free wi-fi in all rooms. Single room: €70-85. Double room: €85-115. 50.73562497.095091445 Best Western Premier Hotel Domicil, Thomas Mann Straße 24-26, ☎ +49 228-729090. Very central location. from €85 for a double. 50.750287.078116 Galerie Design Hotel (Maritim), Kölnstraße 360-364, ☎ +49 228 1848-0, fax: +49 228 1848-0. Located 10 minutes from the city center from €87. 50.7080035001437.09975881443327 Dorint Venusberg Bonn, An der Casselsruhe 1, ☎ +49 228 2880, e-mail: info.bonn@dorint.com. 4-star hotel. from € 82 per room/night. Tagungs- und Bildungshaus CJD Bonn. To the north, approximately 10 minutes from the city centre. Prices start from €42 per person. 50.685967.207548 Grandhotel Petersberg. Used to be the government's guest house, located on one of the Siebengebirge's mountains with a view on the Rhine and Bonn. Hosted several international conferences. 20 minutes by car from Bonn. 50.7187.15249 Kameha Grand, Am Bonner Bogen 1 (Oberkassel), ☎ +49 228-43345000, e-mail: info@kamehagrand.com. Design and ecological lifestyle hotel. There is ample space for conferences and meetings. 50.738087.10610 Hilton Bonn, Berliner Freiheit 2, ☎ +49 228-72690, fax: +49 228-72697005. next to the Kennedy Bridge, very central. 50.722887.11313 DERAG Hotel Kanzler, Adenauerallee 148, ☎ +49 228 68 44 0. Deutsche Post - main post office, Münsterplatz 17. Hours: Mon. - Fri.: 09:00-20:00. Sat. : 09:00-16:00. Closed Sundays..
Cologne — only 20-25 min by train. Get out at Köln Süd for partying at Zülpicher Straße or at Köln Hauptbahnhof for sightseeing and the city centre. Königswinter — home to Drachenfels (1010 ft), crowned by the ruins of a castle built early in the 12th century by the archbishop of Cologne, rises behind the town. From the summit, which can be accessed by the Drachenfels Railway, there is a magnificent view, celebrated by Lord Byron in Childe Harold's Pilgrimage. A cave in the hill is said to have sheltered the dragon which was slain by the hero Siegfried. Take Line 66 Telekom Express until Königswinter. Zülpich — an old Roman settlement with a newly opened museum centered on Roman baths and bathing culture. It is also a gateway to the Eifel region. This city travel guide to Bonn has guide status. It has a variety of good, quality information including hotels, restaurants, attractions and travel details. Please contribute and help us make it a star! This travel guide page was last edited at 10:50, on 13 January 2019 by Wikivoyage user Traveler100bot. Based on work by Wikivoyage users Traveler100, Hobbitschuster, MartinJacobson, Griffindd, Wrh2Bot, Raymond and Ikan Kekek, Wikivoyage anonymous users 91.10.10.250 and 88.77.220.70 and others.